Our interfaces make it possible for BinTrac to communicate and transmit data to third party components. We offer multiple interfaces such as: Ethernet, Digital, Serial, Analog, and Proportional. 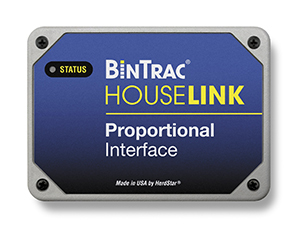 Allows the user to connect to the BinTrac system using a 0-10 VDC analog voltage output proportional to the weight. The Third Party controller must have an Analog Input available and software to use or display the weight data. Provides a user configurable pulsed output as weight removed from the bin. The HouseLink 10D can simulate a dump scale. The Third Party controller must have a Digital Input available and software to use or display the feed use data. Provides a 2-3mV/V proportional output proportional to the bin weight. The HouseLink 10P can simulate analog load cells. The Third Party controller must have a scale amplifier available and software to use or display the weight data. Provides an RS232 or RS485 serial interface to the BinTrac system. 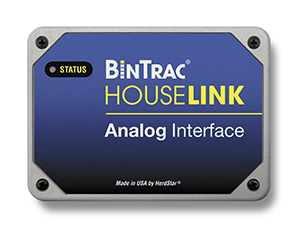 The HouseLink 10S supports broadcast or polled protocols via ASCII or MODBUS data formats. The Third Party controller must have software to use or display the weight data. Provides an Ethernet data connection to the BinTrac system.The HouseLink 10E supports MODBUS TCP for communications with a PLC or other devices. A built in web server provides remote access to bin weight data.